I want to make a correction to this advertisement. There are 300 less children’s books at this book sale because there are 300 books in my car. By next week those 300 books will be distributed into classroom libraries in grade 4-10 for independent reading. The history of the sale begins with its namesake, Mark Twain in 1908. When Twain (Samuel Clemens) moved to Redding in 1907, he had more books than would fit in his new home so he donated over a thousand to start the Library. When Twain passed away in 1910, his daughter Clara donated more books for sale, and 107 years later, the Book Fair is still one of the library’s principal fundraisers. This oldest book sale is also one of the best run in the state. The sale is held in easily accessible Redding Heritage Community Center. As one entered, volunteers provided maps that detail the book table layout, from mystery selections to travel guides to a table marked ephemera. The fiction tables in the adult section were organized by author (which made fast finding for copies of Cormac McCarthy’s The Road). Of course, having the hardcovers and trade paperbacks grouped together could be part of a sociological study in recent popular reading trends as evidenced by multiple copies of the The Stieg Larsson Trilogy/Girl with the Dragon Tattoo series (the fascination apparently over). There were wide aisles to accommodate the “book sale bump”- a result of patrons trying to read titles while carrying overloaded bags or boxes. The volunteer help was outstanding; students (middle-high school aged) manned tables to tally books or straighten shelves. Rather than shy away, they approached shoppers with retail-like patter, “Would you like a box to place your holdings?” They checked book prices book-by-book and reloaded bags once they finished counting. Their adult supervisors handled several cashier’s tables. Outside, there were boy scouts who sold baked goods and (predictably) asked if patrons needed help carrying books to cars. This book sale was one smooth operation. 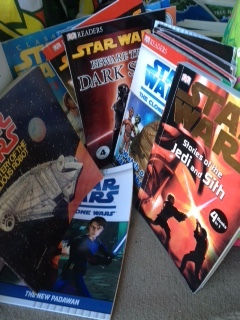 One large box filled with a variety (40+) of Star Wars related books. I am anticipating renewed interest with the December (18th, 2015) release of The Force Awakens. 10 neatly stacked copies of Jeanette Walls’s powerful memoir of her homeless parents in The Glass Castle for a Grade 12 English course. 5 copies of Under the Same Sky ( 2005) by Cynthia DeFelice which deals with migrant Mexican workers on an upstate New York farm; ideal for a small book group or lit circle. (Good story; horrible book cover). Multiple copies of books from R.L. 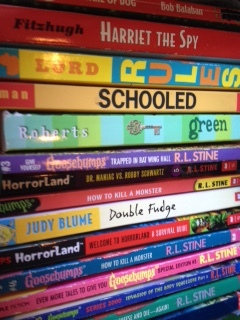 Stein’s Goosebumps series and from Rick Rioden’s Percy Jackson series. Final price for 300 good quality, high interest books for independent reading libraries in grades 4 through 10? I know that greatness of a nation starts and continues with the practice of reading. Your efforts will be felt in many public school classrooms in Connecticut not so far away. I Wish I Had Thought of Id, Ego, and the Superego in Dr. Seuss's "The Cat in the Hat"
A Memorial Day Speech that Remembers Those "Hearts Touched with Fire"